Nicole Foreshew, a Sydney-based Aboriginal artist, has taken out the 2014 Parliament of New South Wales Aboriginal Art Prize - announced at the awards ceremony held at Parliament House overnight. Her work, It comes without seeking 1, was chosen by judges Matt Poll, Carly Lane and Stephen Gilchrist. 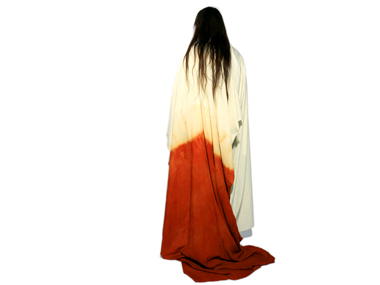 The photographic piece depicts an unidentified person draped in a multi-hued dyed robe. A member of the Wiradjuri nation, Nicole has been a finalist of the Parliament of New South Wales Aboriginal Art Prize before, and in 2012 won the associated UNSW Art & Design Indigenous Professional Development Award. She has taken part in several group shows across Australia and internationally, and in 2013 completed, Born in Darkness Before Dawn, a major public artwork commission for the City of Sydney and most recently exhibited in Hereby Make Protest, at Carriageworks. The Hon Don Harwin MLC, President of the Legislative Council, opened last night's proceedings, and noted the Parliament’s commitment to the Aboriginal community in NSW. “This Prize has a history of providing a unique and powerful forum through which the artists can connect with a broad audience, and the Parliament has been to have seen so many artists enter, grow and flourish," he said. Also speaking at the ceremony was the Hon Troy Grant MP, Minister for the Arts; Cr Paul Lake, Mayor of Campbelltown City Council; Ms Cate Sims, Aboriginal Relations Specialist for Coal & Allied and Professor Ross Harley, Dean, UNSW Faculty of Art & Design. In addition to the main Art Prize, the Awards ceremony also encompassed the 2014 UNSW Art & Design Indigenous Professional Development Award, which includes an Artist Residency at UNSW; the opportunity to work with UNSW staff in a medium of choice; a solo exhibition at EPS Gallery, UNSW and up to $500 worth of art materials, travel expenses and per diems. The winner this year was Nicole Monks, for her work, My Country, Mine Country; a mixed and new media piece that uses television screens and earth to explore the artists’ traditional and contemporary identity. The Parliament of New South Wales Aboriginal Art Prize is currently on display at the NSW Parliament on Sydney's Macquarie Street, and will be until 31st October. Entry to the exhibit is free and open between 9am to 5pm Monday to Friday. 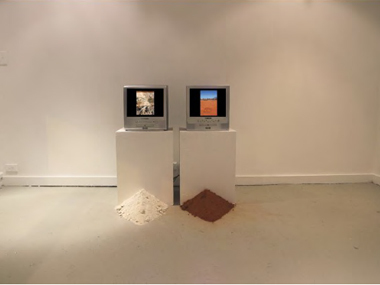 Nicole Monks won the 2014 UNSW Art & Design Indigenous Professional Development Award with a mixed and new media piece that uses television screens and earth to explore the artists’ traditional and contemporary identity, My Country, Mine Country.